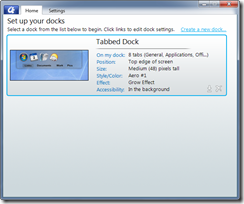 Stardock has released today a new beta (v1.99) for the highly anticipated ObjectDock Plus 2. ObjectDock Plus 2 is the follow-up to the hugely popular ObjectDock Plus which gives you the ability to organize shortcuts, apps, etc. into a functional dock. 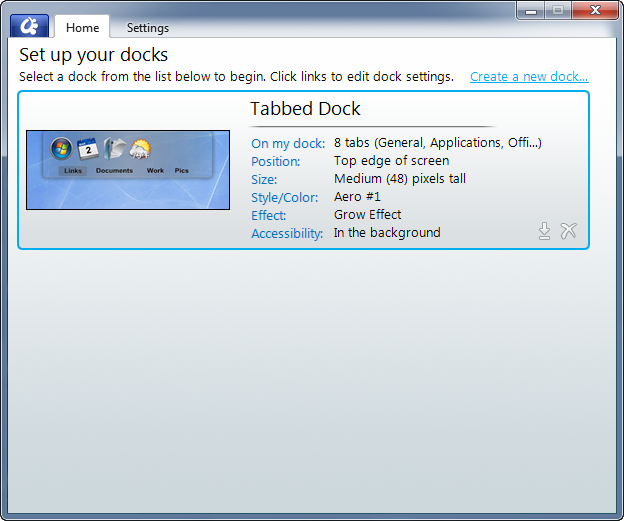 OD+ also features tabbed docks which makes organizing even cleaner as you can make tabs for specific applications, games, etc. Improvements to weather-docklet accuracy. Fixed issue where it could get stuck with cached results. Current users who have upgraded to ObjectDock Plus 2 can update via Impulse. You can also still upgrade to the OD+2 beta or by the current version which includes beta access by visiting the ObjectDock website. Thanks ID, and thanks to the Devs!!! ok, how does one show icons and png's in other locations when wanting to edit an icon? i've added locations to the index but those locations are not shown in the display. Em...i get an error or rather an warning from my Anti-Virus software(ESET Smart Security 4)about ObjectDock Plus Beta v1.99 update i got the same thing with v1.98 So...is ESET right or wrong? The WinCustomize issue is something with ads we're trying to sort out with Google since yesterday. The crash report dll is fine, it's been in there for years. I don't know why it's suddenly yelling now, I use ESET as well. Please re-add 'Run as Administrator' option on the right click menu! Nice to see an update! THANKS! 1) Under Windows 7 64-bit, only 32-bit applications show up with proper window thumbnails in the running tasks dock I have. 64 bit applications have the same old low-res non-skinned (via iconpackager) default icon whether they are open or minimized now. 32 bit applications behave as expected. 2) Using two adapters and three monitors (1|2,3), if I select monitor 2 for the zoomer dock, it always pops to monitor 3. There is no way short of text editing the .ini file to get a zoomer dock to move to monitor 2. Once there, it works fabulously, so there's no performance or other issue involved. when i attempt to browse to another folder for icons and png files in order to change the dock icon, nothing happens. what am i doing wrong? Nice list of updates. Thanks! I get the same thing. It opens up every image I have in C:\Program Files (x86)\Stardock\ObjectDockPlus2 but won't let me browse to a folder of my choice by selecting browse from the drop down. Quoting MadDeez, reply 8when i attempt to browse to another folder for icons and png files in order to change the dock icon, nothing happens. what am i doing wrong? I had to manually type in the directory I wanted to get it to work. Clicking on "Browse" apparently does nothing. Still no option to change the tab font, but at least I don't really change that ever. Now if we could get the coloring feature updated like WB's, that would be fantastic (and an option to make the color change global to all tabs). Yup, they didn't make this easy. Instead of hitting browse hit options then show navigation. Then just go to where your icons are and select a package. It wasn't easy to find but once you do remember how you got there. About to DL it now. Very excited to see this! "Added Explorer-view "Folder" tabs for use on tabbed docks! (Windows 7 only)"
How do those work exactly? Not sure what to do with it or what it does. No Plus/Minus images? Just the default ones? There was a problem browsing to this folder. Please try again. The above message is now displayed when I attempt to change a dock icon. Start menu still not appearing properly. The above message is now displayed when I attempt to change a dock icon. If it makes a difference, I'm using Windows 7 64-bit. wow. that was nice. i tried to edit post #16 and a new post was created. glen beck will soon declare it a progressive plot to take over WC. I also read of (but haven't tried reproducing locally yet, hopefully i'll be able to) a problem whereby you can't move a zoomer dock to monitor #2 in a 3-monitor system. Will have to give that a try. -Running-indicator choosing is hidden..er I mean available..from within the "Style" area of the options for zooming docks. Check out the links on the right, its the 4th/last one. You can now pick your indicator and move it up/down as you wish ; some skins have a default now built in to them. Sorry, but can we please have the old IconBrowser back ? It was perfect, why change it at all ??? Since #2 is the main central monitor, this glitch is a bit of a pain. I believe that OD is reading 3 monitors correctly in it's menu, it just must be getting confused internally when selected. Jim...as far as I know they've never been editable through the UI. Been using the method below for years now. I'm pretty sure that most of my skins all have that line as well as the images in the skin folders. So your saying we have to do each skin by hand now whenever we change them? Or is your example above the new line method? So is this still suppose to work? Oh well. you can't win 'em all, but thanks for all of the other improvements.